Flavor Text: They are known to track their prey for days or even weeks at a time. Just curious, does anyone use this card? 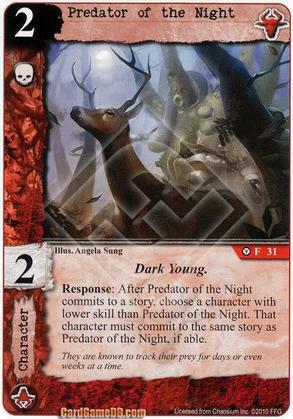 I have a Shub/Yog deck that features a lot of the Dark Young, but Predator of the Night isn't in it just because he seems so pathetic. Does anyone have experience, good or bad, that might help me decide if I should find a spot for him? I could see using Altar of the Blessed to bump up his skill, thereby making his ability a little more relevant. He's also a candidate to drink some of the Black Goat's Milk (a very thematically-accurate connection too). Is it worth taking a lesser card just to further benefit from Dark Young synergy, or should I just rock Black Dog?